There’s no doubt that Easter is one of the most loved, holiest days in the Christian church. Even people who aren’t committed to church attendance suddenly appear at Easter. What a perfect time to expand your reach into the local community. Make soul-winning fun for volunteers and those you want to catch by using fun evangelism ideas. Kids and adults alike won’t be able to resist these exciting activities. Bring souls to the cross this year with some new and a few old evangelism ideas. Flower seed packet giveaways: Kids love giving gifts to their friends and gifts make good invitations to a special Easter service. Plan a power-packed Easter service for your children. Buy seed packets from a wholesale seed store or home improvement store. Prepare to give each child 3 or more seed packets. It helps to have a small fundraiser before Easter for extra funding. Print large stickers that say, “Celebrate spring with me! I’m inviting you to a fun Easter service at Jackson Creek on April 14th. Please come!” Place them on the seed packets. Tell your kids how to present these invitations and what they should say. Door hanger gift bags for neighbors: Door hanger gift bags are a fun way to reach out to neighbors when you can’t catch them at home. Purchase clear plastic door hanger bags and tuck some goodies inside them. Things like Easter egg sticker sheets, Easter bookmarks and handmade Easter cards make nice goodies. Provide each child from your children’s church with a few bags to give to neighbors. Backyard Easter plays: Easter plays are traditional ways that churches present the gospel to their communities. Enlist help from the kids and take the show on the road. Ask a few parents to host a neighborhood Easter play, right in their backyard. Instead of performing Jesus’ death on the cross, (that would be tough for kids) create a human video to an Easter song. Present the backyard play each weekend in April and lead kids and adults to the Lord. I love doing these! Kid-friendly Easter dinners: A kid-friendly feast is so much fun for children. Host a tasty feast with fried chicken legs, colored eggs, mini carrots and celery sticks. Have a feast sitting on the ground, like Jesus and the disciples at the Passover meal. Provide grape juice and bread talk about the meaning of communion. Dress up the dining area and make it memorable for children. Easter egg decorating parties for kids: Choose an off night, like a Friday or Saturday evening for this evangelism outreach. Of course, the focus of Easter isn’t really coloring eggs but there’s no denying that the secular world loves this activity. 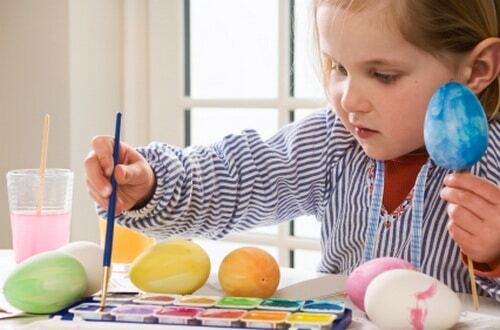 Invite new children to join you for an egg decorating party. Ask them to bring boiled eggs and you provide bowls or cups of dye. Play an Easter video for kids in the background to really set the theme. Read Mimi’s parable for children, The Young Boy and the Great Mountain and follow her on her blog, Encouragement for Christians.